With multiple indicators suggesting an economy in true rebound from the recession, the markets continue to track a steep trajectory. 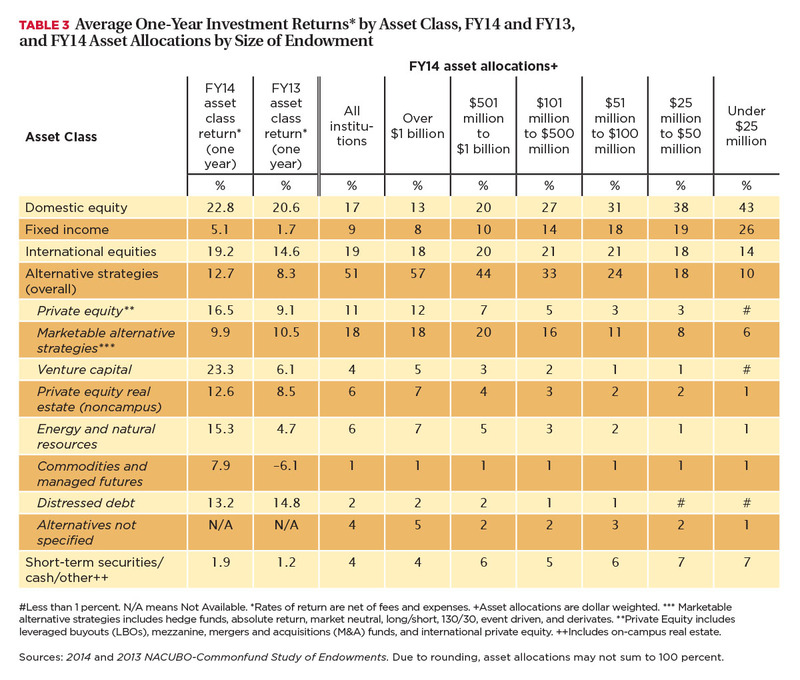 The 2014 NACUBO-Commonfund Study of Endowments explains high-flying investment strategies. While the Great Recession has technically been over since the summer of 2009 and stocks have generally been rising ever since, other negative factors remained. High unemployment, stagnant wages, and slower-than-expected overall economic growth caused a great deal of volatility in financial markets and left most American consumers in the doldrums between FY09 and FY13. But in the spring of 2014, the economy suddenly began to take off. Gross domestic product (GDP)—the value of all goods and services produced, adjusted for price changes—shifted from a decline of 2.1 percent in the first quarter of 2014 to a robust gain of 4.6 percent in the second quarter. The unemployment rate dropped from 7 percent during fall 2013 to 6.1 percent by the end of June 2014 and continued to fall in the months thereafter. Many other indicators—from industrial production to residential construction—suggest that the economy has finally begun to regain the footing lost during the recession. The good economic news soon launched U.S. and international equity markets. During the period between July 1, 2013, and June 30, 2014, the U.S. stock market, as measured by the Standard and Poor’s 500 index, jumped 24.6 percent. Foreign stocks, based on the MSCI ex-U.S. index, followed suit with a 23.3 percent gain. Stock markets were particularly resilient, rising despite several rough patches during FY14: a 16-day federal government shutdown in fall 2013 that economists estimate cost $24 billion and lowered economic growth in the second quarter of the fiscal year by 0.6 percentage points; continued below-average economic growth in much of Europe and growing worries about the Chinese economy; Russia’s conflict with Ukraine, which rattled many emerging markets; and the winding down of the U.S. Federal Reserve’s “quantitative easing” program, credited by many analysts with propping up the stock markets for much of the past three years. Growing investor confidence in the U.S. economy also benefited college and university endowments, which rocketed to a 15.5 percent average investment gain (net of fees) in FY14, according to the 2014 NACUBO-Commonfund Study of Endowments (NCSE). The FY14 performance was nearly 4 points higher than the average reported for FY13 (11.7 percent) and the best performance since FY11’s 19.2 percent. And continued economic growth during the first half of FY15 suggests that the upward momentum in endowment performance may continue. This overview of the results of the 2014 NCSE takes a look at the investment strategies institutions used to achieve their results, and examines the fiscal and other challenges endowment managers and other higher education leaders are facing in FY15 and beyond. Eight hundred and thirty-two American colleges, universities, and higher education foundations participated in the 2014 NCSE. Collectively, these institutions held a total of $516 billion in endowment assets as of June 30, 2014 (see Table 1). Nearly 11 percent of the participating schools had total endowment assets of over $1 billion, while approximately 13 percent had funds that were less than $25 million. The average endowment among all these participants was about $620.2 million, while the median was $109.8 million. Institutions with over $1 billion in endowment assets accounted for 74 percent of the total endowment dollars among the 2014 NCSE participants. While endowments of all sizes benefited from the favorable market conditions in 2014, the greatest beneficiaries appear to have been the largest ones. The over–$1 billion funds reported an average one-year net return of 16.5 percent, nearly 5 percentage points higher than the prior year (see Table 2). Returns for all other size categories were otherwise clustered around a narrow range between 15.2 percent and 15.8 percent. This is a sharp reversal from FY13, when the average one-year return for endowments below $25 million (11.7 percent) was nearly identical to that of the $501 million to $1 billion (12 percent) and over $1 billion (11.7 percent) categories. More importantly, for the largest endowments, the average annual return of 8.2 percent for the 10-year period ending June 30, 2014, was 1.6 percentage points greater than the average returns (6.6 percent) of the smallest-sized funds, suggesting significantly greater long-term performance during the past decade for the larger funds. De-emphasizing bonds and alternatives. While all institutions benefited from the rise in stocks, a reduced emphasis on fixed income assets by larger endowments may have contributed to the difference in overall performance by size. As Table 3 shows, the largest endowments had only 8 percent of their total assets in bonds (domestic and foreign collectively), while funds between $101 million and $500 million had 14 percent, and those below $25 million had 26 percent. Bonds in FY14 returned 5.1 percent for endowment portfolios, compared with a 22.8 percent gain in domestic stocks and 19.2 percent rise in non-U.S. equities. “In 2012, bond yields were near historic lows,” explains Scott S. George, president and chief investment officer for Mason Investment Advisory Services Inc.
English agrees wholeheartedly with this advice. “We continue to maintain a diversified portfolio, with portions allocated to real estate, commodities, hedge funds, and private equity, in addition to more traditional fixed income, and domestic and foreign equities,” he says. While equities shook off these concerns and resumed their ascent in late calendar year 2014, investors faced a number of challenges in the early part of FY15: continually weak economies in Japan and much of Europe; conflicts in Ukraine and the Middle East; and steep plunges in oil prices that could further dampen economic growth in a number of emerging markets. The combined factors caused U.S. stocks to fall more than 7 percent from the highs set in the early fall of 2014 before bouncing back in the early winter. On the other hand, continued good economic news for the U.S., such as strong growth in GDP in the July-to-September 2014 period and slower but still respectable gains in GDP in the final quarter, have caused many analysts to predict that the nation’s economy may continue to expand, which helped U.S. markets recover some of the ground lost in the early fall sell-off. George notes the advantage of maintaining a long-term outlook regardless of current market conditions. “It is important to note that the purpose of a diversified portfolio is to maintain asset classes that move in different directions [non-correlated asset classes] over a variety of market environments to reduce volatility,” he says. KENNETH REDD is director, research and policy analysis, NACUBO. Investment experts and higher education leaders discussed some of the insights reported in the 2014 NACUBO-Commonfund Study of Endowments (NCSE)—and provided a preview of the challenges still to come for chief business officers and institution investment managers. Access “Understanding the Results of the 2014 NACUBO-Commonfund Study of Endowments and a Look to 2015 and Beyond” by going to www.nacubo.org and clicking on the Research tab. Last spring, the board of trustees at Augustana College, Rock Island, Ill., asked me to re-examine our endowment spending policy in light of the strong returns we were experiencing. Although we determined that the policy remained appropriate, our conversations led me to revisit the topic of prudent spending, which we had last reviewed in 2008. Market events in 2008 had forced Augustana—just like many other institutions—to quickly address the issue of appropriation from individual endowments that were below historic dollar value (HDV). At that time, the Uniform Management of Institutional Funds Act (UMIFA) set a threshold on appropriations from underwater endowments, and the college opted not to make up spending from those endowments with supplemental draws from unrestricted assets. After Illinois’ adoption of the Uniform Prudent Management of Institutional Funds Act (UPMIFA) and the market appreciation of the past several years, we’ve had the opportunity to revisit our policy—not in a time of crisis, but with the luxury of time. Illinois adopted UPMIFA in 2009, replacing UMIFA. Among other changes, UPMIFA permits an institution, after considering seven specific factors, to “appropriate for expenditure or accumulate so much of an endowment fund as the institution determines is prudent … ,” subject to donor restrictions. The key points for Augustana are that “prudent” is not defined, and Illinois did not include a rebuttable presumption of imprudence, providing even greater flexibility—or uncertainty—for Illinois-based institutions. For the college to address prudent spending from an underwater endowment fund, we realized that we first had to answer three questions. What is the value below which it is no longer prudent to spend? Our goal at Augustana is to grow the real value of each endowment and the total pool of invested securities. However, reflecting on the experience of 2008, our floor for prudent appropriation is the worst case, not our goal; and we’ve reaffirmed that our floor remains historic dollar value. We believe it is prudent to appropriate from an endowment, as long as we’re reasonably confident the endowment will at least return to HDV at the end of our measurement period. If we project that an underwater endowment will earn returns sufficient to recover in value, even as we draw an appropriation from it, what is the appropriate horizon to permit the fund to recover its value? Regarding this question—the period over which an endowment fund can recover to threshold value while the college still prudently spends from it—we determined a reasonable period of time for Augustana is 20 years: the average of the current year and the life of the college’s longest physical assets. Appropriations from an endowment support both immediate needs and needs at least as distant as our longest-lived assets. The college’s substantial asset base is expected to be in use for more than 40 years, so the midpoint between that and immediate use—20 years—was chosen as the period to evaluate the likelihood that an endowment fund will return to the threshold value. How confident should we be that an endowment fund will recover? I found this question to be the trickiest. How confident should we be that an underwater endowment will return to our threshold value at the end of the time period we’ve selected (HDV and 20 years, respectively)? 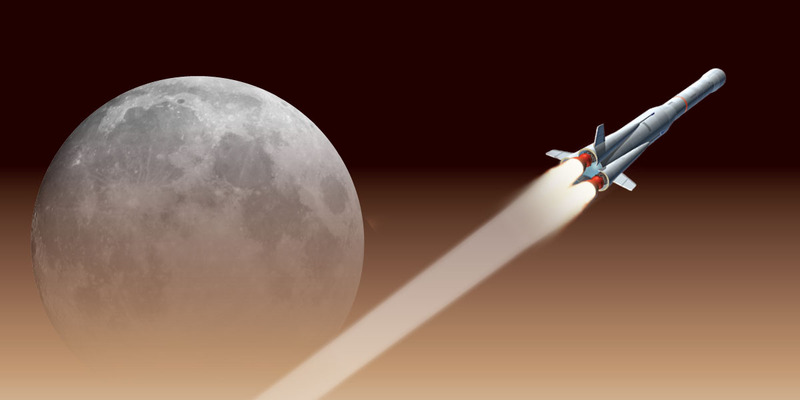 If an endowment is $0.01 below threshold value, then it’s reasonable—and statistically nearly certain—to assume it will return to threshold value in 20 years, if we have anything like historic market returns. But what if it’s 5 percent, 10 percent, or 25 percent underwater? If we consider spending from an underwater endowment, the second consideration is to determine the acceptable probability that the endowment fund will recover. In other words,does the college deem it prudent if, statistically, after 20 yearsan endowment fund recovers to threshold value 50 percentof the time, or 75 percent of the time, or 90 percent of the time? We selected a target probability of 90 percent that the endowment will recover to threshold value. This means that for any endowment fund exactly at threshold value right now, the college would forecast a 90 percent chance that, with continued appropriation, the fund recovers to threshold value after 20 years. In our analysis, if the appropriation from an endowment is never frozen, regardless of how far below the threshold the endowment fund value goes in any year, then the probability of recovery after the 20-year horizon is approximately only 85 percent (in this case, 15 percent of the 5,000 draws didn’t recover). If we keep the target of a 90 percent probability, then the appropriation from the fund must cease when the fund value falls below a certain level. Solving for the point where appropriation ceases yields a value of 90 percent of the threshold value (an unfortunate duplication of the 90 percent chance of recovery after 20 years). Consequently, if endowment appropriation from an individual endowment is frozen when the fund value drops below 90 percent of threshold value (HDV, in our case), then each fund has a 90 percent likelihood of returning to threshold value over a 20-year horizon. The upshot is that we’ve determined it prudent to appropriate from an endowment if its market value exceeds 90 percent of HDV. While we hope that we aren’t again in a situation like that of 2008, and that our institutions’ endowments do continue to grow in real terms, any college should have a policy in place for prudently managing its endowment. The best time to evaluate and create a policy is when you have breathing room, and are not in the middle of a crisis. DAVID A. ENGLISH is chief financial officer and vice president of finance and administration, Augustana College, Rock Island, Ill.
Based on responses from 832 U.S. college and university endowments and affiliated foundations, the 2014 NACUBO-Commonfund Study of Endowments (NCSE) provides extensive data to help institutions evaluate their investment returns and compare results by endowment size and institution type. Tables, charts, and graphs include data on investment performance, asset allocation, spending rates and policies, institutional debt, management expenses, and governance issues. The final report (Item NC4075) will be available on NACUBO’s website beginning in March, and is priced at $250 for NACUBO members and $750 for nonmembers. Purchase of the study allows institutionwide access to the results. To order, go to www.nacubo.org/Products/Online_Research_Products.html. 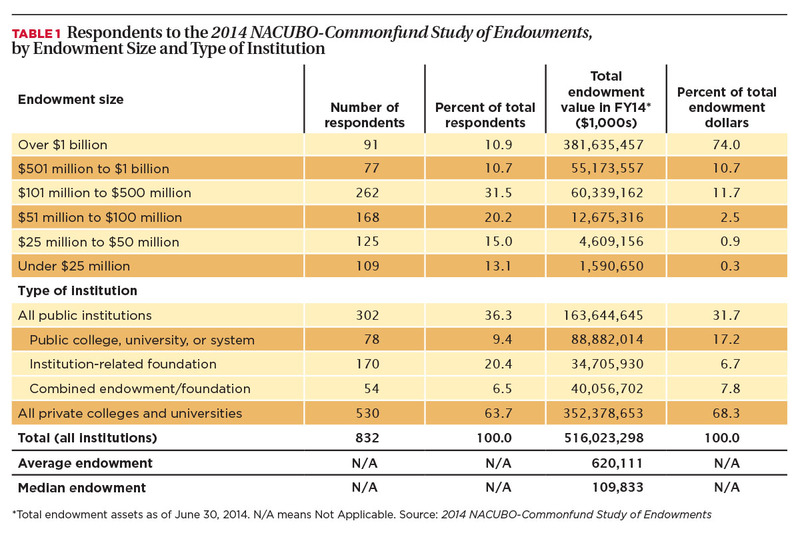 The following firms contributed to the 2014 NACUBO-Commonfund Study of Endowments. Without this generous support, NACUBO and Commonfund would not be able to collect and publish such a comprehensive analysis of endowment management practices.